The use case shows how to automatically do a metal only ECO. The setup is the same as the "Automatic Functional ECO", except the new added gates being mapped to spare gates. 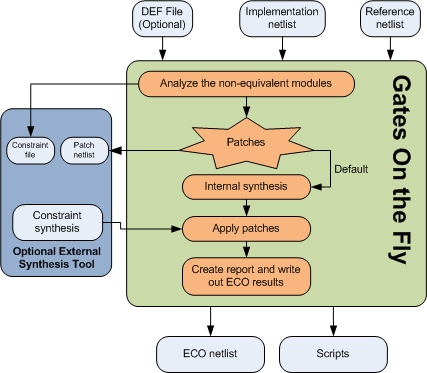 Users provide Implementation netlist which is under ECO, Reference netlist which is re-synthesized after RTL modification and modified RTL module names. A DEF file can be read in for physical information. Internal Logic Equivalent Check engine analyzes the non-equivalent modules and figures out the minimum logic patches to fix the Implementation netlist. After functional ECO is done, spare gates list is extracted from Implementation netlist and the patches are mapped to spare type only gates. read_def("topmod.def"); # Read Design Exchange Format file, optional. # a new updated spare list file will be written out.